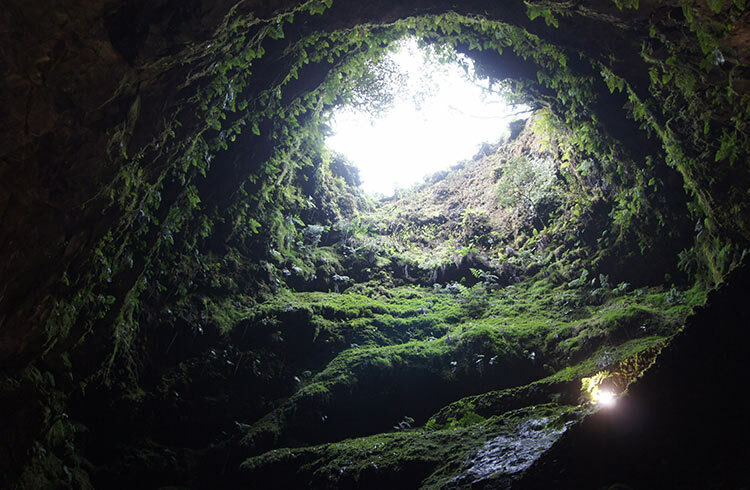 Sam Bedford takes a real-life journey to the center of the Earth on Terceira Island in the Azores. Entering the narrow concrete tunnel, I feel more like I’m walking into a former USSR prison than into a natural wonder. I step out onto a platform, and a flash of disbelief floods my body. I’m about a third of the way down a dormant volcano’s chimney. Nuno, the 33-year-old guide, who’s lived all his life on Terceira, explains lava burst through that hole above our heads 2,000 years ago. Today, Nuno assures me, it’s dormant. I’m standing inside a volcano on Terceira Island in the Azores, an autonomous region of Portugal, consisting of nine volcanic islands in the Atlantic Ocean, 850mi (1,368km) south west of Lisbon. After seeing photos of volcanoes surrounded by green prairies, I felt instantly drawn to the Azores. In particular, to the mysterious Algar do Carvao volcano. Three weeks later, I’m on a two-hour flight from Lisbon to some of Europe’s most remote islands. What Makes Algar do Carvao Unique? 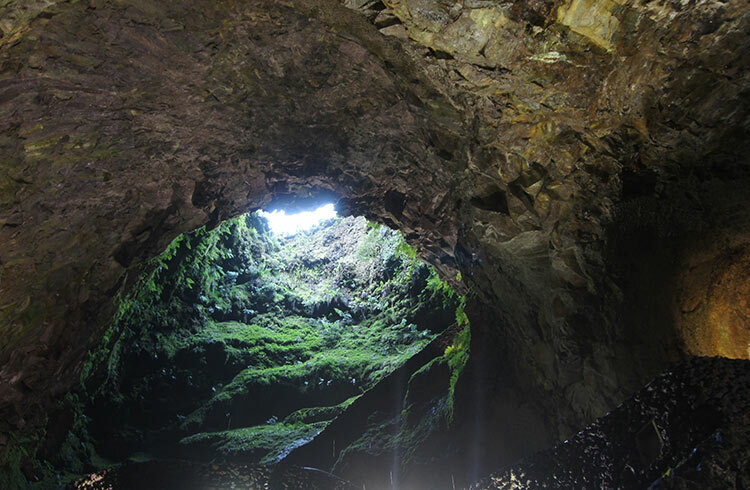 Algar do Carvao is one of the only volcanoes on Earth that can be explored inside on foot. And certainly, the only one where it’s possible to go inside to get married or watch a concert. Geologically, it has the world’s highest concentration of silica stalactites. As Nuno drives up the steep mountain road, jagged craters covered in a blanket of green dominate the undulating landscape. Nuno pulls over and points to two jet-black lumps in the near distance. 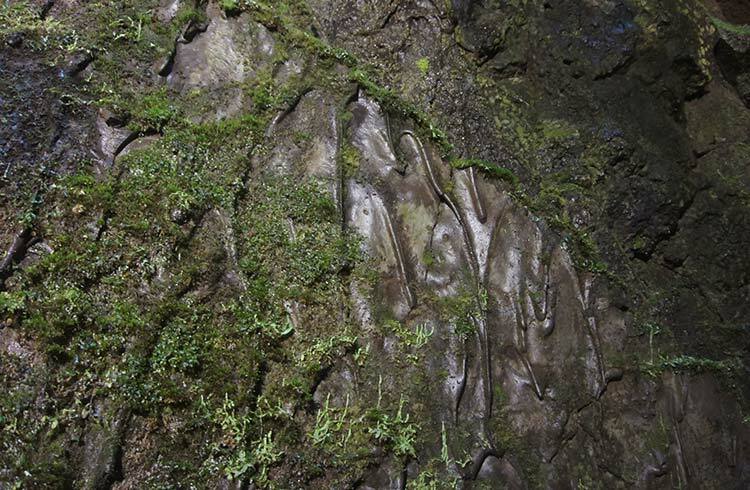 These are the Black Mysteries, formed after Terceira’s last eruption in 1761. 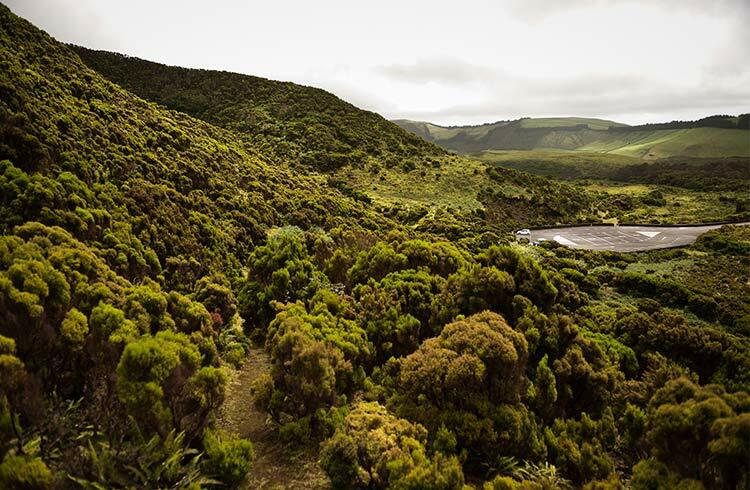 Endemic vegetation hasn’t had time to dissolve the basaltic rock into fertile soil. Algar do Carvao stands nearby; from this perspective, it looks like a child’s drawing of a volcano – wide at the bottom with a conical top. Most volcanoes lose their shape after an explosive eruption, as unstable rocks fall in on themselves over time, but Terceira’s volcano still retains its shape. Continuing up the narrow road, we head towards the top of Algar do Carvao, the last stop on our three-hour geological tour. Everything looks deceptively normal at the top. So normal, I wouldn’t believe we’re driving up a volcano if I didn’t know where we are. We park and walk between mounds of volcanic rock covered in lichen, ferns and moss lining the jet-black path towards the information center. I’m standing between huge rocks next to a small building – there’s no indication we’re about to walk inside a volcano. Nuno points to a hole in the ground about 30m (98ft) ahead on the other side of a barricade and explains that it’s the top of the chimney. Once inside the information center, we enter the cone along a concrete passageway. Algar do Carvao is divided into three sections: the chimney, the Cathedral and the lake. We’re inside the chimney, from where a total of 338 stone steps descend 330ft (100m) into the volcano’s pit. All around is a constant dripping; moss and vegetation on the outside absorb rainwater like a sponge. This drains through the rocks causing permanent rain and mist, and the damp air is heavy to breathe. I look up through the mouth and can see the overcast sky. Two trees bend over the exposed opening, and dark green ferns and moss cover the walls near the top. They’ve evolved acidic roots to turn volcanic rock into fertile soil. Further down at eye level this foliage becomes patchy and thins to bands of lime green moss. Natural light doesn’t reach this far down, and the plants can’t grow. My attention moves to the black patches on the walls, it looks like an enormous block of dark chocolate that has dripped down the walls and solidified. This is rare obsidian or volcanic glass. The inverted crater on the vertical wall opposite captures my eye. Nuno explains how a bubble of molten gas melted the wall as it rose from the depths of the Earth. I walk further and further down the steps. The constant dripping now feels like a persistent drizzle and reminds me of standing in a forest on a rainy day. As I walk deeper into the pit, I enter a cavernous space known as The Cathedral, where the occasional music concert and wedding takes place. Named for its cavernous dome, its ceiling is about 115ft (35m) high. I notice the mosaic-like patterns decorating the walls; iron-rich reds, browns and oranges juxtapose next to jet-black basaltic. Molten magma created the Cathedral seconds before erupting out through the chimney. Our voices echo inside the chamber. A crystal-clear freshwater lake covers the base of Algar do Carvao, formed by the constant rain. 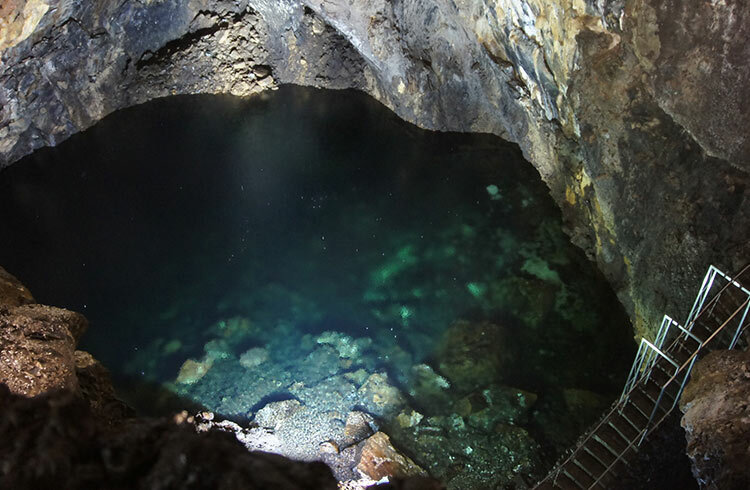 Nuno estimates it’s about 39ft (12m) deep, although it can rise to 82ft (25m). During periods of drought, the water completely dries up. Down here, the dripping has an eerie echo. The only lifeforms this far down are bacteria, and a fleet of endemic spiders, centipedes and beetles found in the Azores that lurk in the cracks and crevices. Before climbing back up the 338 steps, I take a moment to let it all sink in. This is where molten magma exploded out from the depths of the Earth 2,000 years ago. The same magma that created this tiny island in the middle of the Atlantic Ocean. Algar do Carvao is approximately 8mi (13km) north of Angra do Heroismo (Terceira’s main town). The most convenient way is to rent a car when you arrive at the airport. Drive to Angra and follow the signs. 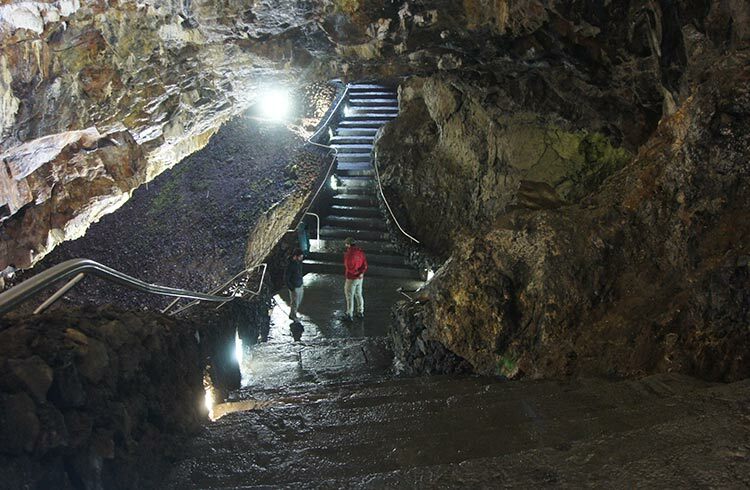 Tour companies combine a trip to Algar do Carvao with Christmas Cave (lava tubes) and the sulfur fields. Tours last around three hours and give a better perspective of the volcanic landscape. I arranged my tour from Angra on the day of the excursion. A handful of travelers rent a bicycle and cycle from Angra in the summer. This is more of an adventure, but the roads are narrow and you’re cycling uphill to the volcano. Bring waterproofs because of the constant wetness. The steps are slippery. Wear sturdy and comfortable shoes. Turn off the flash on your camera, which can damage the rocks. Limited opening hours make visiting difficult. Algar do Carvao opens from late March to the end of October from 2pm to 6pm. In the low season (late October to mid-March), it opens from 2.30pm to 5.15pm on Tuesdays, Wednesdays, Fridays and Saturdays only. Unless you’re on a tour, try to arrive before 4pm. Be aware there are more than 300 steps into the volcano. Each step you take down, you’ve got to take back up. With convenient and cheap transport, you can discover a completely different side of Portugal just an hour or two out of Lisbon. Professional travel writers know the big difference an opening line can make. Kick your writing skills up a notch with these tips and examples. Scuba diving is one of the world’s most thrilling and fascinating sports – it’s safe too if you follow these simple rules.